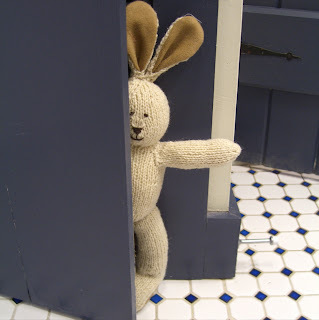 Bunny is hiding in the cupboard because he is embarrassed. Me: "Why are you hiding Bunny?" Bunny: "I'm embarrassed because I'm not wearing any clothes. I have lost my trousers." Me: "Well don't worry Bunny - we can just make you some more." 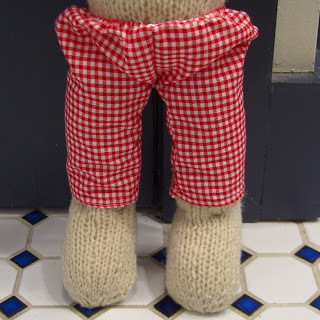 Bunny (sadly): "I don't think these fit me - they are rather short." Me: "OK I'll make another pair." 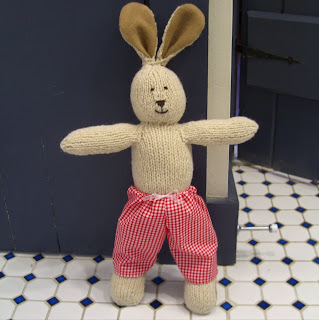 Bunny (horrified): "These are far far too tight." Me: "I'm sorry Bunny I don't know why I'm struggling to make trousers today. I'll try one more time. Third time lucky!" Bunny: "Oh thank you - these fit just right. 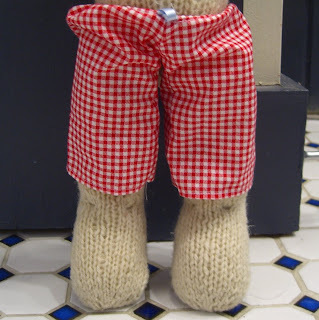 I'm very pleased with them - I'm going to wear them to the bunny picnic this weekend." Are you going to the bunny picnic this weekend? Like Goldilocks...the third one's always "just right!" Your bunny is so cute, I like how he is peeking, really love his red checkered pants. He looks fine and dandy now. He'll be most sought after at the picnic. I love the photo of him hiding in the cupboard! The mice in your previous post remind me of the mice in a childrens programme that was on many years ago, called 'Bagpuss'. Did you get it over there? All the animals were soft toys and stop frame animation was used. What a well-dressed bunny! And you can't go wrong with gingham! Oh he looks great in gingham!